We are loving the look of secondhand finds in gardens and outdoor rooms as we put together our next issue of Flea Market Décor (on newsstands at the beginning of April). To enhance the creative ways you display secondhand treasures outdoors, add plants to your garden that recall yesteryear. Here are six easy-care suggestions that look great in cottage gardens year after year. Bonus: Each of these plants is perfect for flea market fans who love a good bargain. All are great “pass-along” plants to give and exchange with friends. They propagate easily and give you great value with very little investment once they are under your care. Just like your treasured flea market finds. 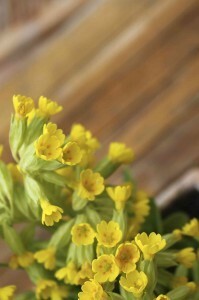 The cowslip plants in my North Carolina garden first came to me as pass-along plants from my sister-in-law’s garden in Tennessee. They bloom early in the spring and resemble perfectly round, ready-made bouquets. I use them as full-sun border plants near showier, bushier perennials that bloom in the summer and conceal the cowslip foliage once it’s past its prime. The hardy Rudbeckia hirta is such as classic it goes by many other names, including Brown Betty and Golden Jerusalem. This easy-care perennial blooms mid-summer in large, vibrant clumps that attract butterflies and birds. 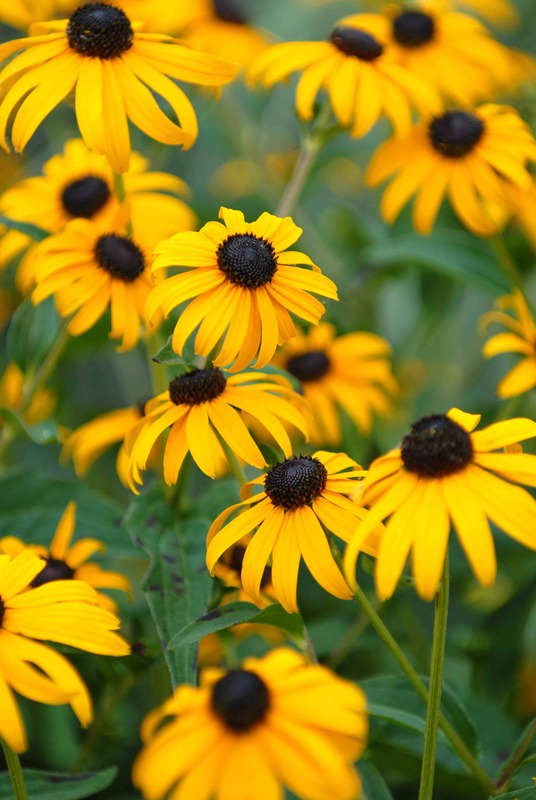 Don’t spend money on more than one good Rudbeckia. I have seven or eight Black-Eyed Susan plants that came from one plant I bought five years ago. In early spring, simply dig up the outer parts of big plants and start new plants in another sunny spot. Décor idea: Do you collect vintage Mason jars? They are perfect for the Rudbeckia arrangements you want to display inside. Lamb’s Ear I bought a lamb’s year plant last year when I spotted a vigorous patch growing happily under the eaves of a very inhospitable office building. I planted it in the most inhospitable spot in my own garden, a spot where I previously could persuade nothing to grow. Except the lamb’s ear. To my delight, it is flourishing and spreading. 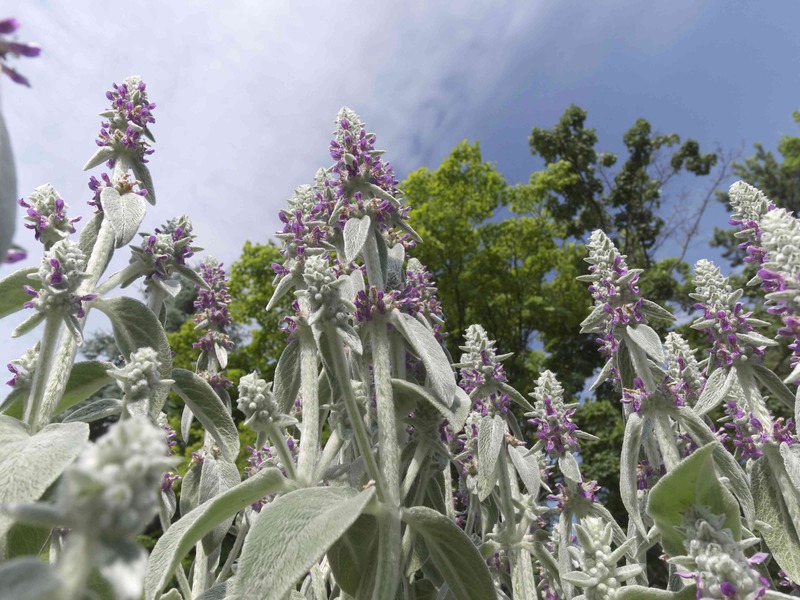 Lamb’s ear, which like many classic flowers originates in the Middle East, was first grown in England in the eighteenth century. Its soft, silvery leaves look great in borders along stone paths, and its purple flowers spike upward for a “cottage garden” accent. Bee Balm I know it is spring in North Carolina because I can smell the new, fragrant bee balm leaves pushing their way through the soil. They start as a low ground cover and by mid-summer grow into tall plants with stunning, mid-summer red flowers that attract hummingbirds, butterflies, and of course, bees. Caution: Many varieties are waist-high or even taller, so plant them along back borders where they won’t obscure other plants. They look very pretty along picket fencing. 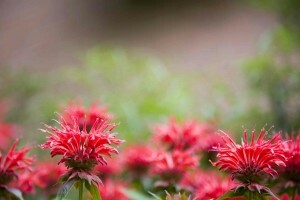 Bee balm spreads easily, which I love. My numerous patches started as one stalky wedding gift five years ago. When one patch becomes too large, dig up a clump to start someplace else. Décor idea: Spiky and colorful, cut bee balm flowers are well-suited to mid-century modern vases. This entry was posted in Decor Inspiration and tagged bee balm, Black-eyed Susan, cottage garden, cowslip, lamb's ear, Mason jar, mid-century modern vase, perennial, Rudbeckia by Flea Market Decor. Bookmark the permalink.